If De Profundis aimed to capture the scent of death, the cold tentacles of a serene end to all can be felt in L'Eau Froide, from the pristine white-lined coffin to earth's cool embrace. I personally find this philosophical attitude to mortality very peaceful and cleasing to the mind. Cold? Yes, it is. But very pleasantly so. I'm a firm believer in the cooling properties of unadulterated frankincense, the kind at the heart of L'Eau Froide, which I burn regularly: After all, the raw material shares terpenic, citrusy top notes in itself, which dissipate and volatilise quickly rendering that cool smoky ambience we associate with stone temples of old. But amongst fumeheads of northern latitudes, removed from the warmth & sun of the Mediterranean where frankincense use flourished, ‘frosty’ and ‘glacial’ are not adjectives we tend to associate with incense (rather pyrocaustic is, although on Perfume Shrine we have devoted a whole series to different varieties and nuances of incense fragrances). Nor is the association of niche orientals ~where incense notes are the bread & butter of perfumers fast becoming rock stars. But frankincense/olibanum, the par excellence incense note, is indeed cool: it can become very smoky and dense when in high concentration, but the more you dilute it the more it gains lemony, fresh facets that inspire deep breathing, the cleansing kind. Serge’s press upon this newest fragrance is probably what matters anyway: ‘People only notice the pyrogen facet in smoky incense burners… but not the coolness, except for the church’s." The terpenic, bright side of Somalian frankincense (reminiscent of crushed pine needles) is given prominence in Passage d'Enfer, much like in the Lutens 'eau' which unfolds the terpenes after a fresh mint start; this exhibits a hint of pepperiness (could it be elemi, another resin?) giving a trigeminal nerve twist. The effect is dry and very clean indeed (but unlike the screechy aldehydic soapiness & ironing starch of the first L'Eau), with a lemony, bitter orange rind note that projects as resinous rather than fruity and a projection and sillage that are surprising for something so ghostly, so ethereal, so evanescent. It's the scrubbing mitt of a monastery in the southern coastline, rather than the standard aquatic full of dihydromyrcenol and Calone coming out of the cubicle in an urban farm. Still this aesthetic is something with which the average perfumista hasn't come to terms with yet; it will probably take a whole generation to reconcile perfumephiles with "clean" after the horros that have befallen them in the vogue for non-perfume-perfumes in the last 20 years. I'm hopeful. After all being a perfumista means challenging your horizons, right? The little human warmth in the deep drydown of the new Lutens comes from the refined, vegetal musks that hide in Voyage d'Hermès or Goutal's Musk Nomade (ambrette seed); eschewing too sweet and powdery for a slightly bitter, metallic edge reminiscent of the iron in blood. The whole projects with a mineral quality, like cool peebles at the foot of a lemon tree. Incense accolytes who appreciate the monastic qualities of Tauer's Incense Extrême, the coolness & pine of Zagorsk and the white lily whiteness of Passage d'Enfer are the prime target of L'Eau Froide. So are those who like Eau de Gentiane Blanche and Voyage d'Hermès. I think L'Eau Froide will be more popular with men than with women who view this dry mineral facet as emasculating. The cool customers of Chanel No.19 (especially the eau de toilette which is rich in vetiver) and Paco Rabanne's Calandre, as well as YSL Rive Gauche for women, might also be satisfied with the silvery sheen of this Lutens fragrance. If on the other hand you prefer for your incense fix the densely oriental mixes like Caron's Parfum Sacré, the rich balsamic formulae like Ormonde Jayne Tolu, and the sophisticated smoky warmth of Hotel Costes, you would be totally disappointed. Then again you might be an omnivore, like me. It's of note that no comparison can be effectively made with Etro's Messe de Minuit: Whereas the Etro is a chameleon, smelling in varying degrees of warm or cool according to your GPS positioning when wearing it, the Lutens is a la la la constant tune that doesn't waver much. I was somewhat confused with last year's Lutens De Profundis and Vitriol d'Oeillet. Though arguably not the height of originality, I see myself dousing myself with L'Eau Froide each time I want to feel that chill on the small of my back that denotes either solace from a heatwave Med-style, or the exciting but safe thrill of peeking within the crypt when demons are hiding low on a snowy winter's day. L’Eau Froide, a clear eau de parfum concentration of fragrance sees his previous L'Eau Serge Lutens joined by a similar-looking bottle. (1.7oz/50ml and 3.4 oz./100ml, 69 and 100 euros respectively at select doors stocking Lutens fragrances from March 2012). For our readers an advance sample sprayer is offered. Please tell us your incense memories, if you have any. Draw is open till Sunday 26th midnight. I love incense frags, be they cold or hot. To be honest, the cool side of Serge works best for me; my favorites are Bas de Soie, Gris Clair and Encens et Lavande. You mentioned some terrific cool incenses. Other favorites of mine are Messe de Minuit, YSL Nu edp & Bond 9 Silver Factory. Thanks for the review! I first discovered incense fragrances thanks to a lovely SA at Barneys. She's sent me several samples and I now understand why no 2 smell alike and have so enjoyed collecting (and using) several of them. L'Artisan Mon Numero #10 is my favorite so far. In a very hectic streessfulvlife, it just makes me utterly serene. I have Andy Tauer Incense Extreme on order and can't wait until Monday when I'll receive it. Whereas I have never coma along well with warm and ambery perfumes, cool and cold notes, such as iris and fankincense sing on my skin. Passange D'Enfer and No. 19 EDT are among my favorite perfumes, and I also love incense in Dzonghka. I always enjoy minty accords and slightly mineral musks, and based on your review I have very high expectations for L'Eau Froide. I love incense, especially that "turpenic" quality you describe. It reminds me of the wood cabins and dark green pine forests of northern Ontario, my favourite summer escape. The only incense memories I have is hippy nag champa-which I like. I love and own Passage d'Enfer and quite a few of the the other similar perfumes you mentioned, so I think I should give this L'Eau Froide a try. Gris Clair is one of my very favorites. I love Gris Clair also so have a feeling I'll like L'Eau Froide. Thanks for the review! Wow - this sounds great. Zagorsk is my favorite among the CdG Incense Series, Musc Nomade is a summer favorite of mine as is Eau de Gentiane Blanche - so this sounds like a total "winner" for me. "the standard aquatic full of dihydromyrcenol and Calone coming out of the cubicle in an urban farm"
No church or temple incense memories for me, at least not from childhood. My earliest incense memories are from my teenage years, mostly of nag champa (which I still like in small doses). My sister used to complain that it smelled like "flower farts." I like all types of incense--I'm an omnivore too! I lean more toward the cool and dry, though. Passage d'Enfer is my favorite incense perfume, based on a sample that once came my way. Sounds interesting... The only memories that I have of incense are from high school; I used smoldering incense sticks to perfume my room, yet I inadvertently perfumed the entire house. My parents disliked them. Yeah, I use quite a bit of incense as well. It just does something for me. I'd love to try this! My memories of incense is mostly from Japanese temples apart from perfume, I really like Incense Extreme and L'Air du Desert Marocain. At 5, we moved to a more suburban area, with a new church where incense was not used. So I didn't have specific memories; but when I resmelled incense later on, immediately I thought about my grandma - nothing specific, but she used to bring me to churches during our walks, and the association came back. Not the pure, lemony frankincense, but the rougher, more resiny burnt concoction used in Italian churches back then. Years ago I traveled to the West coast of CA from the East coast of NJ by the city. And I discovered Nordstroms which was not in NJ at the time, nor NY. Inside I fell in love with the store and the perfume area. And I purchased a bottle of Passage d'Enfer, that rich incense that provoked memories from long ago. Yes enter me in the draw, thankyou. Because I have not been around much incense, my incense memories come mainly from other perfumes, like Armani Prive's Bois d'Encens and Byredo's Chembur. It's funny because your review describes a scent that I had hoped to find in De Profundis before its actual release, a stone-cool incense. So I am very excited to try this one. My earliest incense memory is a midnight mass at our parish church, the several people fainted from the heavy billows. You make this fragrance sound rather delightfully creepy; surprisingly, you make me want to try it! Who doesn't need a touch of the crypt on a hot day? My incense experiences were pretty limited, not being a huge fan of the cheap synthetic oil scented stuff that was my early introduction to incense. As of late, I have been lucky enough to come across some beautifal natural incenses that have completely changed my experience of incense. Mermade Magickal Arts produces some of the best I have smelled. Their Kyphi has quickly become my favorite. I also have had the chance to work with some high quality raw botanicals and their perfumery extracts, and that has opened my eyes even more to their possibilities. I would love to see what Lutens does with L'Eau de Froide. I am new to his scents, but I think it would be a neat contrast to the small decant I have from Amber Sultan. E, I have never smelled incense perfume of any kind. My niece gave me some raw/rocks/resin frankincense for Christmas and I would very much like to know how to burn it. I used to burn Nag Champa incense all the time before I quit smoking. Ha ha Please enter me in the drawing. My first memory of incense was walking into a small church in London and admiring the cool, earthy ambiance around me. It wasn't until years later that I realized I was smelling incense, but the smell and the feeling I will never forget! 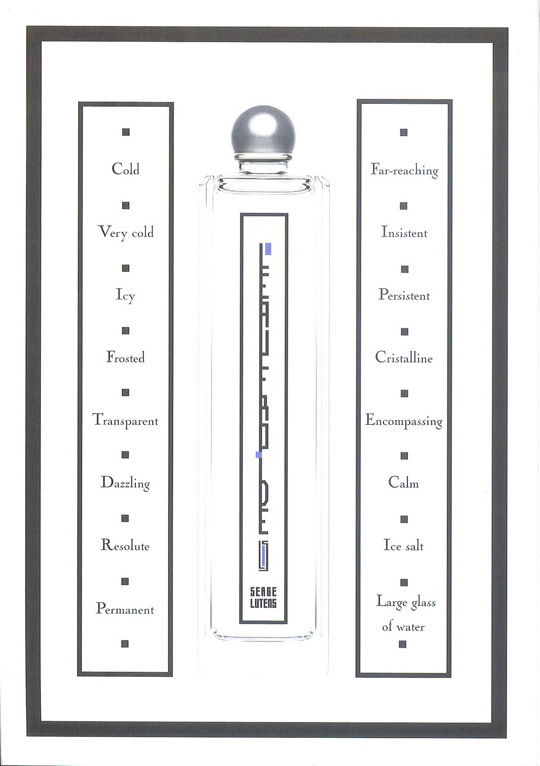 I would love to try a sample of L'Eau Froide! Thanks for the draw! I had never connected Chanel 22 with incense until one day when I was wearing it and walked into a Russian Orthodox church. The church was permeated with the scent of incense and it smelled like the beautiful perfume I was wearing. Please enter me in the drawing for L'Eau Froide! Another incense and church person, one of my earliest memories: being young enough to sit on the kneeler and play with the coins for the collection plate, and being fascinated by the swinging censer issuing white billows of spicy smoke. Love that scent memory: hand-hot metal coins and spicy smoke and polished wood. My family was never a church going one, so I don't have any kind of memories of that sort with incense. My first exposure didn't come until I was about 15 when I was introduced to those slow burn incense. The most evocative incense memory for me is of the incredibly beautiful, sweet, smooth, smokey incense burned at Japanese shrines on religious holidays. My Mother made sure my sister and I were not sequestered with all the other American kids on the base and took us adventuring in our short time in Japan. I now recognize these scents as Hinoki Juniper, Aloeswood, Sandalwood and Frankincense. I have not had the opportunity to smell any of Serge's amazing works of art but I look forward to it someday! Yes, that was a *little* pun. I do remember incense from Catholic Mass. I just loved that smoke billowing my way. My incense memory is from Catholic Mass as well. When I was in the third grade, we attended Mass every morning before class. Unfortunately, one child each day was picked to sing solo. When my day came, I was petrified. I believe I sang into my uniform... lol..as no one heard me. I'm not as versed in scents as some of the previous commenters, but what I've been searching for is exactly what you've described...I remember, indeed, the high, burning, coolness of mass - particularly in the Eastern rite and (more importantly perhaps) hundreds of hours spent in zendos with the (generally) high pine as the only accompaniment and ultimately only other presence in the quest. I too would love to smell this. My incense memory is of St. Mary's Church in NYC. They actually make their own incense in the basement of the church and the entire place smells AMAZING. It's also a beautiful place. The town of Hoi An, Vietnam, is a place full of different and wonderful aromas, one of them being the incence they burn. For a tourist, it is a town of culinary pleasures and cultural history. And smells. 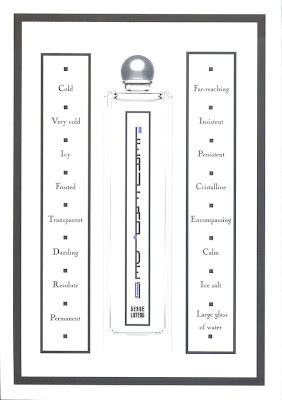 I have little experience of incence perfumes but L'EAU FROIDE sounds so intriguing that I would love to smell it. I liked burning incense years ago, but now with a toddler, two cats, and a dog, I don't intentionally burn much of anything. I prefer to get my incense from fragrance, and my love has always been Donna Karan Chaos. I have others that I enjoy equally, but Chaos was my favorite for so long that I get so much nostalgia from it! I would love to be included in the draw. Thanks! Raised at school by nuns and then Jesuits I have memories of Christian theatre and song surrounded by incense, family, friends et al way back to my earliest days. Parfum Sacre, Messe de Minuit and Incense extrême. Thank you for a lovely review, and please enter me in the draw. This one sounds like a winner for me! I am also an incense omnivore in fragrances if not in reality. Thanks for the drawing. I see my perfume collection and I realize that I have never tried any incense fragrance. The cute thing is we have different scented incenses. There are sandalwood, jasmine, and ylang-ylang. Jasmine is my favorite. My first incense memory is Roman Catholic mass and then burning cheap incense cones and sticks in the 70's. My first incense fragrance was Om by the Gap (which I would love to have now).I have tried all the CdGs and love incense as a note in many fragrances so would like to try this.Thanks for the review. I don't have any church incense memories and the earliest memories I can remember are the smells coming from the small import shops in Seattle Pike Place Market. The first perfume incense I ever owned was when in the 80's I was in my favorite shop while visiting NYC; Normal Kamali, and her Incense perfume had just launched. I bought both her perfumes, one a very strong church resinous incense and the one that was a lighter version to mix with it. Sadly, the bottle, though beautiful silver covered engraved glass, had silly rubber dropper style tops and every bit of the perfume evaporated over the years and I didn't even realize it until recently! Thank you or the draw! i love the smell of some incenses and I enjoy burning rock incense. Naturally, my incense memories are related to the Church. I remember my cousin always fainting from the smell. Catholic incense was my background until I found the CdG series of fragrances. From then on I explored more, but always go back to them. I love incense frags and this sounds fascinating. I have one incense memory in particular that comes to mind when I read this review. Years ago (20+) I found a little box of cedar incense logs and the wee burner was a house. The smoke came out through the chimney and it smelled amazing, it was so fun. I don't have any specific incense memories, but have become smitten by incense scents. Some recent faves are By Kilian Incense Oud, Erik Kormann Eau du Froliche, and Byredo Encens Chembur. Would love to try L'Eau Froide, sounds fascinating! Mmm cool frankincense, I love the essential oil and also burning the tears as incense. I wear a couple of the Amouage fragrances, their use of Omani frankincense is fabulous. My incense memories? Firstly visiting a Catholic church in Mexico that smelled faintly of incense. Second, going to a nightclub in Los Angeles that had incense on the tables, really strong! Incense is not a note I look for in fragrances but I love the cool aspect it has. Every day I go by the Cologne Cathedral on my way to and from work..and sometimes, on hot summer days, the chruch doors are open and that incense-y fragrant cool air comes wafting out. It is instantly cooling and relaxing. I love to catch that one whiff and I would certainly love to try L`Eau Froide to compare. I've been wearing my sweeter fragrances lately. Tolu is one of my favorites! I am drawn to incense that smell oud-like, Caron Secret Oud will be my next full bottle purchase. Thank you for such an informative blog! What a great draw. I am an on-again, off-again lover of incense. Right now BK's Incense Oud is my favorite. Pasage d'Enfer is a perennial rotator, especially in the summer. Used to love 19, but something in it now gives me a headache. This sounds lovely, esp. on a hot day! No incense memories for me, but Chanel No. 19 is fast becoming one of my favorite perfumes. I adore Nag Champa and burn a stick every morning. Ironically I find that my vintage L'heure Bleue PDT is a dead ringer for it.. I don't have any very distinct memories of the smell of incense, but it has, from the beginning, been my favourite perfume note! My earliest memories of incense is at my grandmothers house. She always burned a stick of patchouli and it made the whole house smell so good! When I was in 2nd grade at Saint Martha's Elementary we had to attend Mass every Friday before lunch. The height of embarrassment was when I passed out in the pew from the intense incense being wafted down the aisle before communion. I adore incense, and still do, it always gives me the safe feeling of being in grade school, smelling the fresh piney sterile smell of floors that had been cleaned the night before. Those grade school scent memories could go on and on, erasers, blackboards, paper bagged lunches growing soggy in the cloak room,.. The intoxicating smell of incense is what I recall from my childhood in Paris....the Sunday mornings spent in a vast Gothic cathedral. The heavy scent permeated the air, and rendered a sense of mystery, and peace. I happen to adore Aedes de Venustes, which has a heady incense smell. Also Turque du Bois sits amongst my perfume collection...very very infused with incense, musk, amber and cinnamon. Mmmmm.